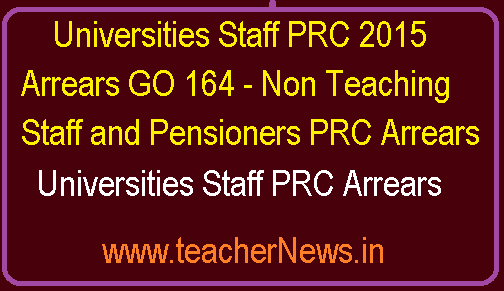 Universities Staff PRC 2015 Arrears GO 164 - Non Teaching Staff and Pensioners PRC Arrears : PRC 2015 Arrears to Universities Non Teaching Staff and Pensioners GO 164 Dt. 15-10-2018. AP Revised Pay Scales 2015 – Payment of Arrears to Pensioners and Non-teaching staff of Universities– Orders – Issued. FINANCE (PC and TA) DEPARTMENT G.O.MS.No. 164 Dated: 15-10-2018. The monetary benefit of the Revised Scales of Pay 2015 was allowed in cash from the month of April 2015 payable on 1st may 2015. 3. G.O.Ms.No.51, Finance (HRM.VI-Pensions) Department. Date: 08.05.2015. 4. G.O.Ms.No.2, Finance (HRM.V-Pensions) Department, Date: 04.04.2016. 5. G.O.Ms.No.98 Finance (PC, TA) Department, dt: 26.06.2018. 7. Representation of A.P. Universities Pensioners Federation, dt.07.08.2018. 2. Accordingly, in the reference fifth read above, Government have issued orders for payment of arrears in Revised Pay Scales 2015 for the period from 2nd June 2014 to 31st March 2015 paid in cash in three installments i.e., on 1st of September, 1st of October and 1st of November, 2018. 3. In the reference sixth read above, the Higher Education department has requested for extension of the orders issued in the reference 5th read above to the pensioners and Non-Teaching staff of all universities in the state. 4. Government after careful examination of the issue, hereby extend the orders issued in 5th read above to the pensioners and employees of Non-Teaching staff of all universities in the state, subject to meeting the expenditure out of the Block Grant of the respective Universities for the Financial Year-2018-19. Universities Staff PRC 2015 Arrears GO 164 - Non Teaching Staff and Pensioners PRC Arrears, PRC 2015 Arrears to Universities Non Teaching Staff and Pensioners GO 164 .